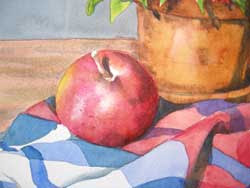 Now I have added a wash onto the apple. I used a slightly damp kitchen sponge to soften the white areas of the apple. After allowing that to dry, I applied another wet wash of Permanent Rose to tie the apple into one unit. I also, after the apple was dry, used VanDyke Brown and French Ultramarine Blue to add the details to shadow areas in the stem and shadow at the bottom of the apple. I used these colors throughout, to deepen the shadows and refine the piece.